The techniques necessary for typewriter construction grew up alongside gun manufacture, as both required precision metal parts. The first typewriter manufacturers, E. Remington & Sons, in the early 20th century split to become Remington Arms and Remington Typewriter Co. Likewise, Smith-Premier typewriters were first manufactured at a gun factory in Syracuse, NY. 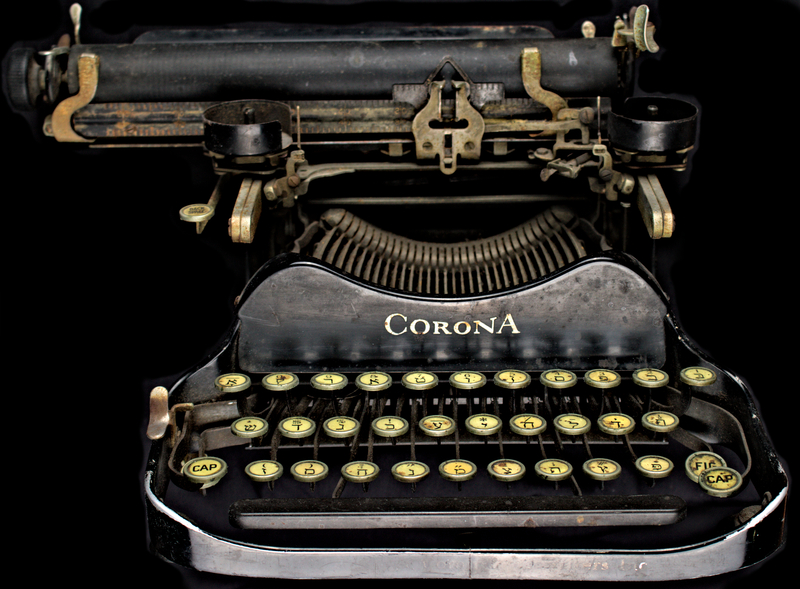 In 1926, the Corona Typewriter Company merged with L. C. Smith and Co., to become Smith & Corona Typewriters, Inc.
Like the earlier Corona Model 3, the Corona XC-R was small, portable, and tough, an appealing alternative to the larger machines offered by Remington and Underwood. The typewriter carriage lifts up and folds forward, to fit into a square carrying case. 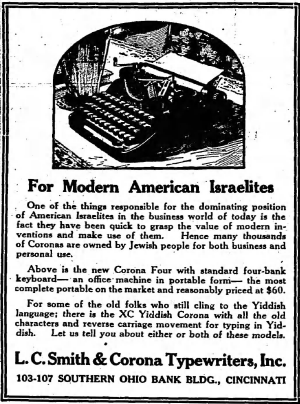 In 1924, the Los Angeles Times ran an advertisement for the Corona-Pacific Typewriter Co., highlighting its range of typewriters “for all foreign languages” with “Reverse movement carriage for languages like Yiddish and Arabic.” The R in the XC-R model name referred to this right to left carriage direction. Even the numerals in the first row run right to left, from 0-1. Advertisement. The American Israelite (Cincinnati, OH), December 2, 1926, Thursday. Page P2. Perhaps as a consequence of its compact size, the Corona XC-R featured a modified Yiddish keyboard, capable of typing both Hebrew and Yiddish but missing several keys common to other Yiddish layouts. The inclusion of the komets aleph, in the upper left corner, indicates the machine was meant for Yiddish. The omission of the double letters could be overcome by simply typing the yod and vov multiple times. Unlike some earlier typewriters, the XC-R included three characters on each key, with CAP and FIG keys to shift the carriage up. Unfortunately, we do not know the provenance of this item or who owned it before it found its way to the JHSGH collections, but its owner would have been in good company. The XC-R model was used by playwright Abish Meisels, a central figure in the New Yiddish Theatre on London’s Adler Street, as well as Chicago journalist Morris Indritz, publisher of the Yiddish quarterly, Yom Tov Schriften. The Jewish Museum London and the Spertus Institute for Jewish Learning and Leadership, respectively, feature these items in their online collections. For more information on Yiddish typewriters, please see this excellent blog post, The Lost History of the Yiddish Typewriter, by translator and Professor of German and Yiddish studies, Nick Block, and The Story Behind the Yiddish Book Center’s Yiddish Typewriter Collection. Next Post: Start a new Tradition in Your Home This Passover!